Thomas Busby (Mobile, AL) has been a professional trader and broker for 25 years, working with Merrill Lynch and Smith Barney. He is a member of both the Chicago Mercantile Exchange and the Chicago Board of Trade. Busby founded the Day Trading Institute in 1996 and it has grown into one of the most successful trading schools in the world. The school operates out of a 10,000 square foot facility and has trained more than 5,000 traders. One year after taking the DTI course, about 70 percent of the students are still trading, one of the highest success rates in the industry. After enormous success early in his career, Busby lost almost everything in the 1987 stock market crash. Following that experience, he developed a low-risk, short-term trading method, which consistently generates profits and is the basis of the Day Trading Institute curriculum. PART ONE A Foundation for Success. CHAPTER 1 The Trader’s Edge. The Aftermath of Black Monday. Revolutions in Technology and Communication. The Dark Ages: Circa 1986. CHAPTER 2 Time Is Money. Know When to Cash Out. CHAPTER 3 Opening the Vault with Key Numbers. Key Numbers in Metals, Fuels, and Commodities. Key Numbers in the Equity Index Futures. CHAPTER 4 Commonsense Market Indicators. The NYSE and Nasdaq Issues. The V-Factor and the TTICK. CHAPTER 5 The Art of Trading. PART TWO Strategies to Win. CHAPTER 6 The Path of Least Resistance. Earnings Season and How to Use It. CHAPTER 8 Making Money with Bernanke. CHAPTER 9 Dancing with the Dax. CHAPTER 10 Money Never Sleeps. Trading When the Sun Rises. CHAPTER 11 Cashing in on Bonds. 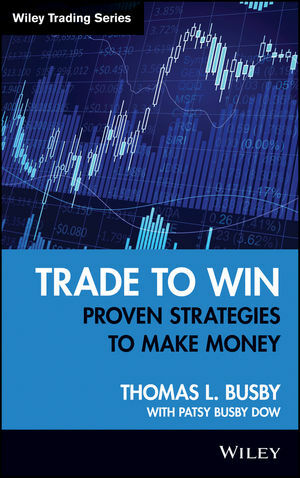 CHAPTER 12 Options Strategies to Make Money. CHAPTER 13 Reaping Profits on the Farm. CHAPTER 14 Going for the Gold. CHAPTER 15 Stocks and ETFs. The Wave of the Future—ETFs. PART THREE The Wild Cards. CHAPTER 16 Beyond the Numbers. Phasing Into and Out of Positions. CHAPTER 18 Psychology and Discipline: The Winner’s Edge. CHAPTER 19 The Last Word.